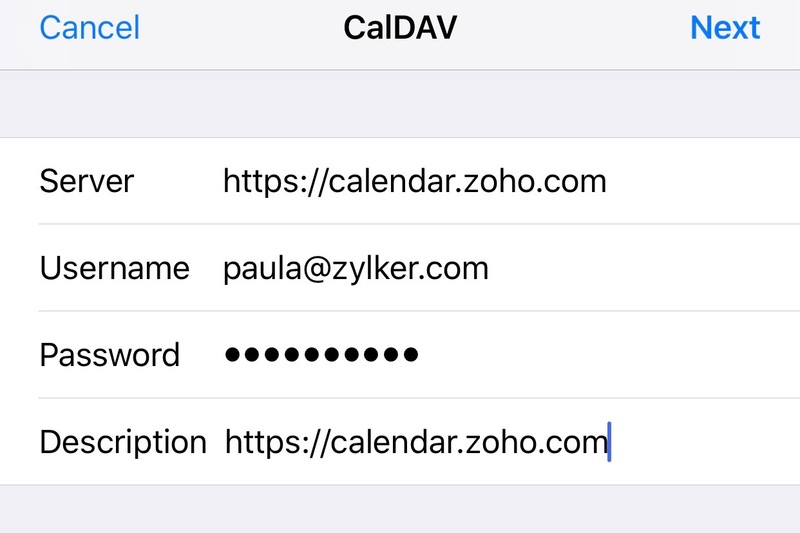 CalDAV sync is a two-way sync feature between your Zoho Calendar and calendar apps that support CalDAV format, which means you can sync your Zoho Calendar on your iPhone's calendar app or your MacBook's calendar or with Thunderbird calendar. You can access Zoho Calendar through the local apps on your device while you are offline and make changes using your device's calendar app by creating a CalDAV account and enabling CalDAV sync. How CalDAV sync makes your work easy? Create/Edit events while you are offline on your phone and it automatically syncs with your Zoho Calendar when you go online. 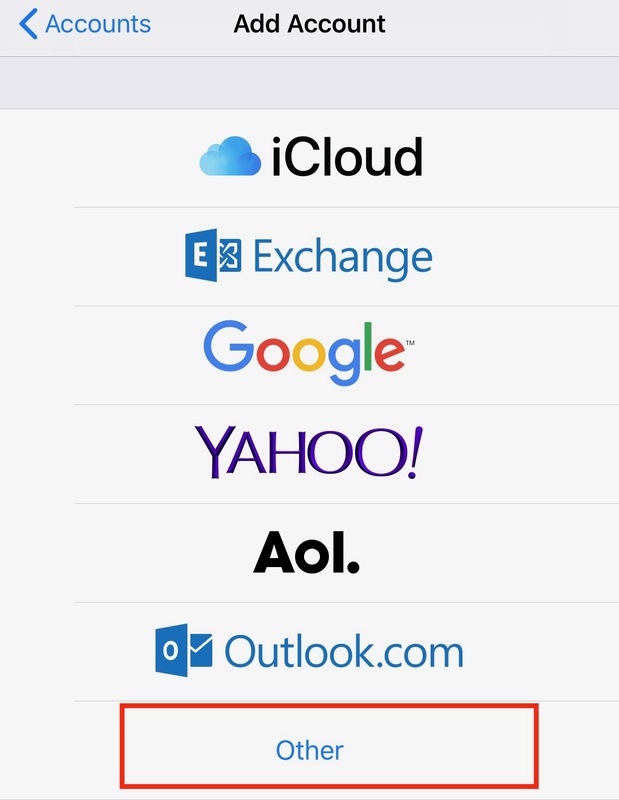 Quickly change your schedule from your phone itself. Sync multiple calendars with your device in one go. You can also sync the same calendar on multiple devices. Get notifications/reminders for events on Zoho Calendar. 2. Go to Settings > Calendar > Synchronize > CalDAV. 3. 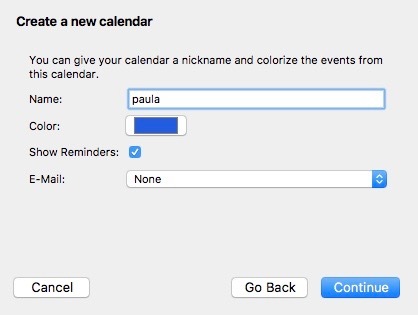 In the My Calendars tab under CalDAV, the default calendar will be auto-selected for CalDAV sync. You can also select the other personal calendars listed below in My Calendars for sync using CalDAV. 4. To sync your Other Calendars (Subscribed Calendars), navigate to the Other Calendars tab in CalDAV sync and select the respective calendars. After the calendars are selected, then you need to proceed with the configuration on your device. 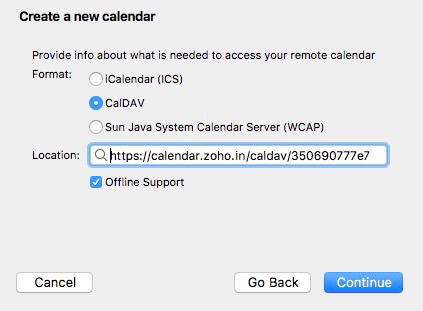 CalDAV sync for Other Calendars is available only for Paid Org users and Personal users (zoho.com). Other Calendars will be synced in read-only mode. You will not be able to add/edit events in these calendars. Initially, make sure you have selected the calendars to be synced from your Zoho Calendar account. 1. 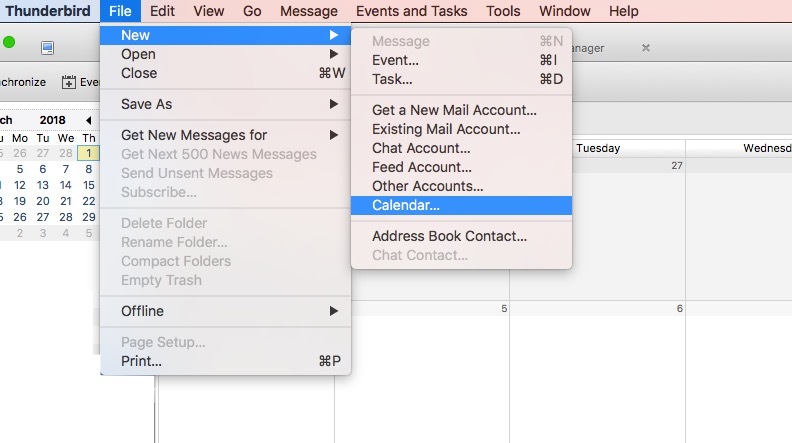 Open the OS X Calendar/BusyCal/Fantastical on your device. 2. Go to Calendar > Preferences > Accounts > Add. 3. 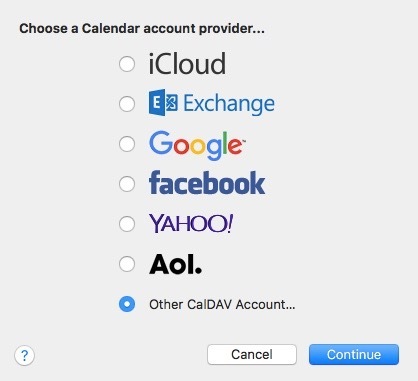 Click Other CalDAV account option and give Continue. 4. Choose the account type as Manual. 5. Fill the Username field with the email ID of your Zoho account and the password. If you have enabled Two-Factor Authentication (TFA) for your Zoho account, generate and use the Application-Specific Password. 6. Enter the server address as https://calendar.zoho.com and Sign in. 7. The events will be automatically synced between both the calendars. 8. To delete the CalDAV account, go to Calendar > Preferences > Accounts, click on the account you want to delete, hit the Remove icon and click Ok.
Before configuring the sync on your iPhone/iPad, go to your Zoho Calendar account and select the calendars to be synced using CalDAV. 1. 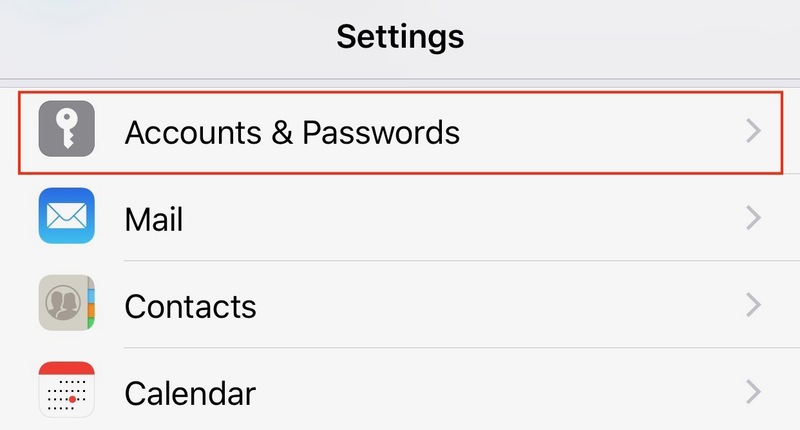 Navigate to Settings > Accounts and Passwords > Add account. 2. Click on Other option in the Add account page. 3. 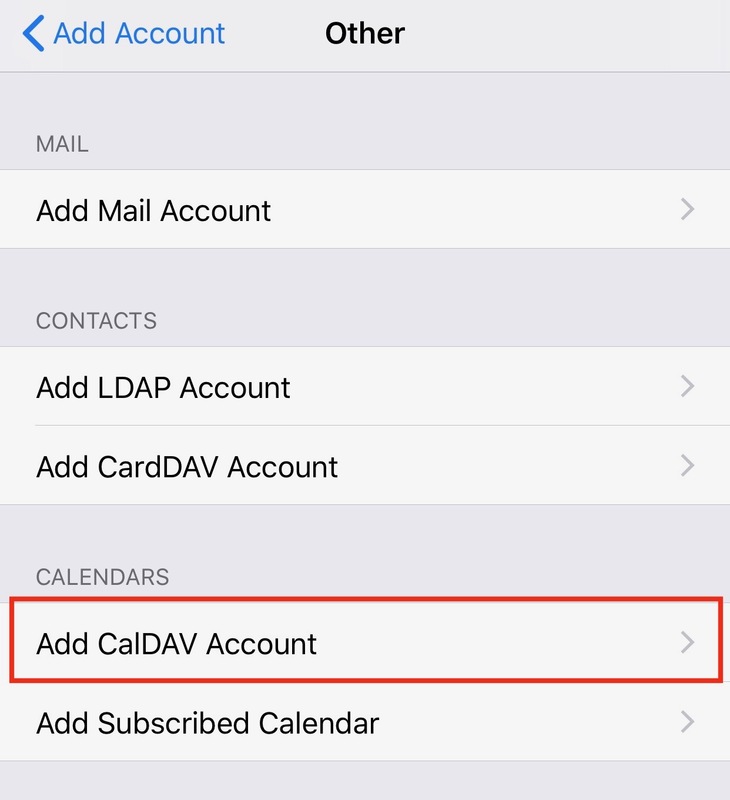 Select Add CalDAV account to proceed. 5. Enter your Zoho account email ID in the Username field and your Password. If you have enabled Two-Factor Authentication (TFA) for your Zoho account, generate and use the Application-Specific Password. 6. 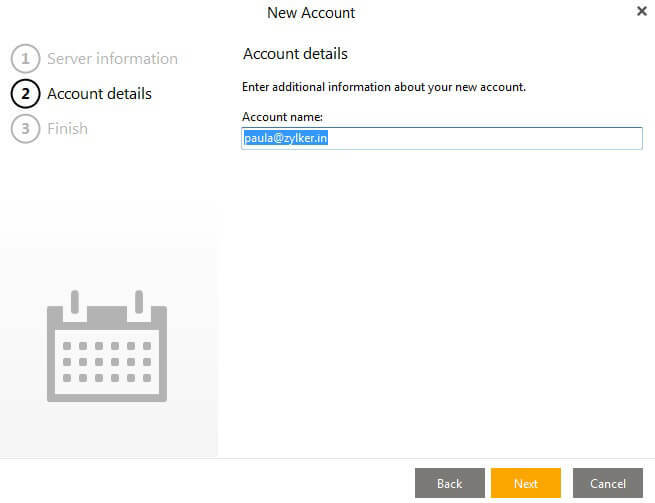 Type your choice of Description for this CalDAV account and click Next. 7. Turn on/off the notifications for Reminders and click Save. 8. 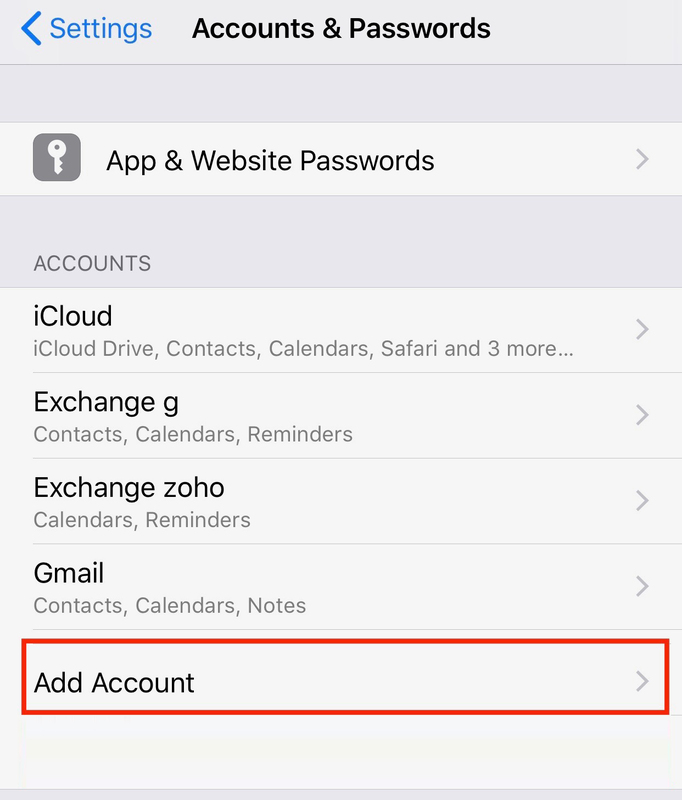 To delete the CalDAV account, go to Settings > Accounts & Passwords > Accounts, click on the account you want to delete and press the Delete Account option. Select the calendars you need to sync using CalDAV on your Zoho Account. You need to fetch the calendar ID from your Zoho Calendar account before you attempt to sync your Zoho Calendar with Thunderbird lightning on your device. If you have more than one calendar to be synced with Thunderbird lightning, then fetch the unique Calendar ID of each calendar and attempt the sync separately. 2. 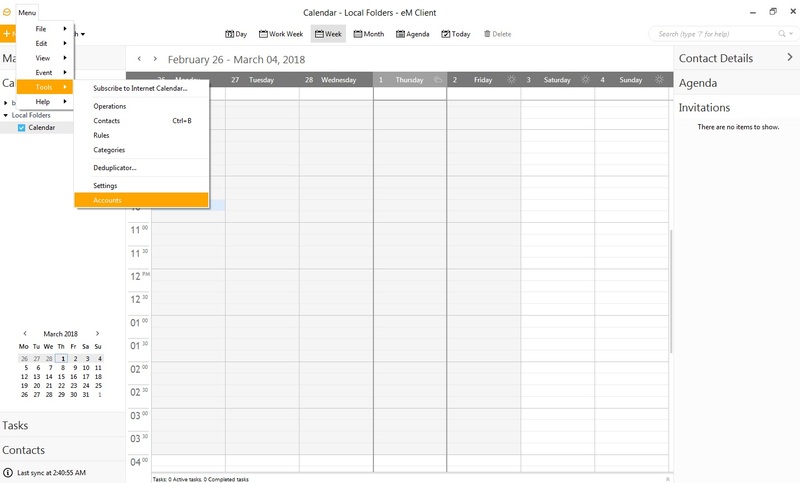 Select the calendar for which you want to fetch the calendar ID by right clicking from the left pane of the screen. 3. Click on Edit from the drop down. 4. In the Edit tab, copy the Calendar ID of the Calendar. 1. Open Thunderbird Lightning calendar on your device. 2. 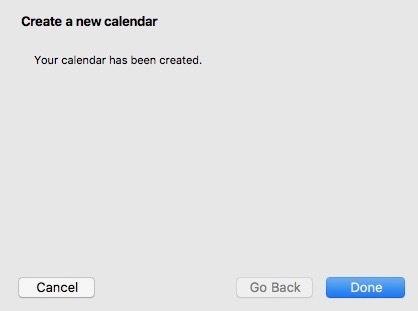 Go to File > New > Calendar. 3. Select On the Network and click Continue. 5. Select Offline support and Click Continue. 6. Enter the Name of the calendar, customize the Color, Reminders and click Continue. 7. Click on Done to complete the process. 8. To delete a calendar added via CalDAV for Thunderbird Lightning, right click the calendar from the left side of the screen. Click on Unsubscribe. Go to Zoho Calendar and select the calendars to be synced using CalDAV before attempting to configure sync on eM Client. 1. Go to Menu > Tools > Accounts. 2. Click on the Add icon. 3. Select the option Calendar in the dialog box. 4. Click on CalDAV from the list of calendars and tap Next. 5. 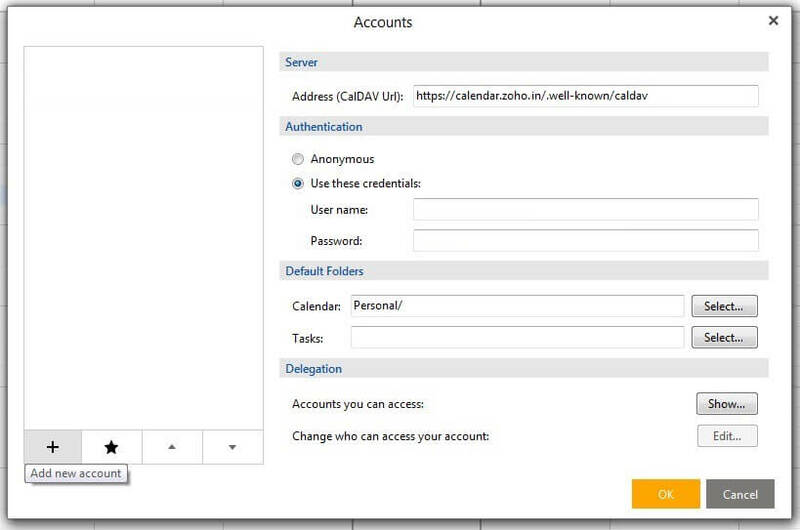 Enter the Account Address as https://calendar.zoho.com/.well-known/caldav in the Server information dialog box. 6. Enter the Zoho Calendar email ID in the Username andtype the Password. If you have enabled Two-Factor Authentication (TFA) for your Zoho account, generate and use the Application-Specific Password. Click Next. 7. Fill the Account name in the Account details sections and click Next. 8. 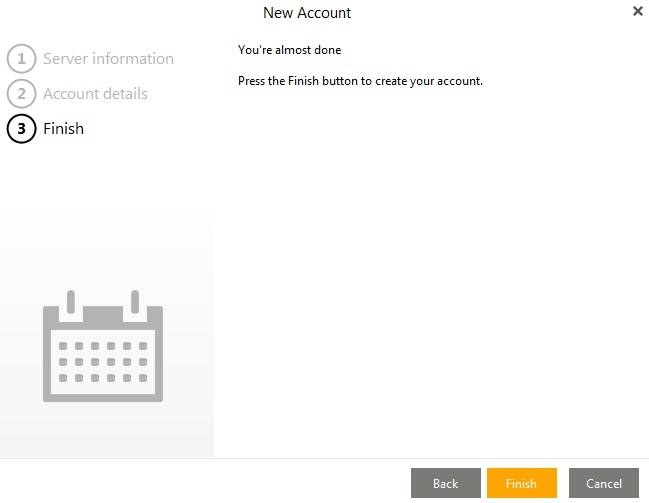 Click the Finish button to create the account. 9. Go to your calendar and hit Refresh to sync all events. 10. 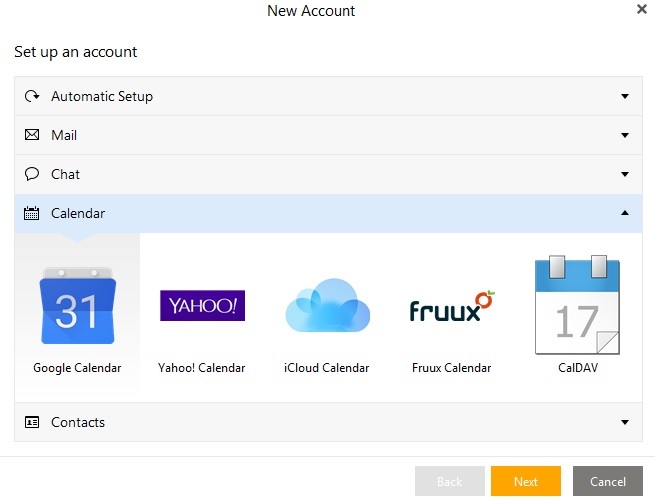 To delete a CalDAV account on eM Client, go to Tools > Accounts. You will see a list of the eM client accounts added on the left-hand side. Click on the account you want to delete and hit the delete button next to it. Zoho Calendar helps you sync only your Personal Calendars (My Calendars) and Subscribed Calendars (Other Calendars) in Zoho Calendar through CalDAV and not the Group Calendars/App Calendars. The Other Calendars are synced in "Read-only" mode and cannot be edited. When the CalDAV account is deleted, all events created and synchronized under the particular CalDAV account will be removed but will remain in your Zoho Calendar account. Calendars from your Zoho Calendar account synced to other calendar apps using CalDAV can be deleted/removed only from the calendar apps and not from the Zoho Calendar account itself. When you delete a Zoho Calendar from the CalDAV account on other calendar apps, the calendar automatically gets disabled for CalDAV sync in your Zoho account and you need to enable later. 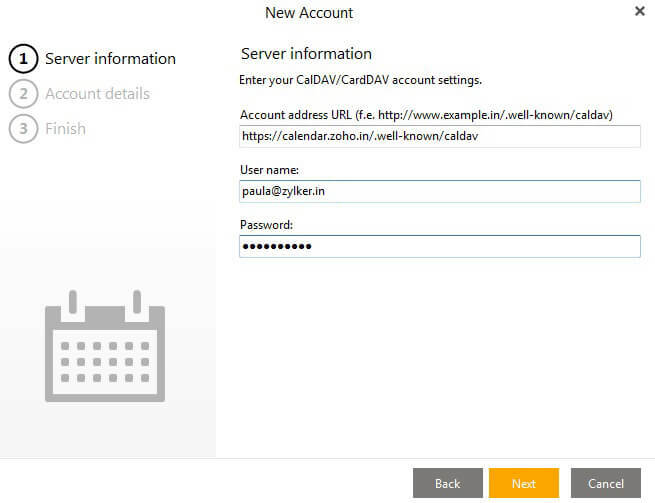 You cannot create/add a new calendar on your Zoho Calendar account using the CalDAV account configured on your device's calendar. 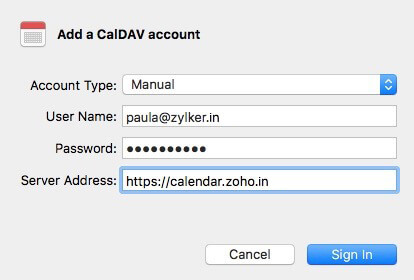 If you are facing issues while logging into your Zoho Calendar account via CalDAV, then make sure to check for your Username and Password. If you have enabled Two Factor Authentication (TFA), you have to generate Application Specific Password to proceed. When you synchronize your Zoho Calendar with the CalDAV account, you might find that some of the events haven't synced. By default, only the primary calendar of your Zoho Calendar account will be enabled for synchronization. Check if you have enabled sync for all calendars under "My Calendars" in your Zoho Account. If not enable access in your CalDAV settings and sync again. 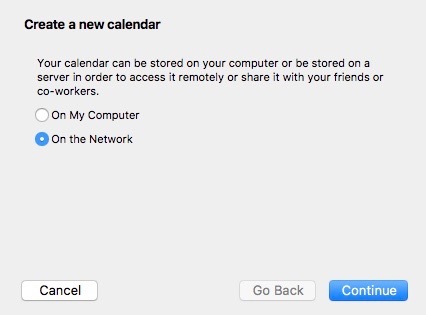 Events from Group Calendars/ Other Calendars/ Shared Calendars will not be synced via CalDAV. Users who are accessing from EU/US should make sure to use the appropriate country-coded domain extensions while accessing Zoho Calendar to proceed without login errors.